For more than ten years, the government has been running a covert UFO program that it doesn’t want you to know about. Officially, the Defense Department has never really acknowledged its existence. But insiders say its offices were headquartered deep within the maze of the Pentagon. According to the Department of Defense, the Advanced Aerospace Threat Identification Program (which never officially existed in the first place) was closed down in 2012, but sources with the defense agency insist the shadowy operation is still active. That this ultra-stealthy program is shrouded in intrigue and mystery is hardly surprising. Roughly 40 percent of Americans believe that the government is deliberately hiding evidence of alien existence from the public. Those suspicions are only likely to increase as findings, revelations, videos and news about the program leak out. Here are some of the tantalizing things about the program we are learning about. On October 4, 2017, the program’s director, Luis Elizondo, sent his boss, Defense Secretary James Mattis, a letter of resignation. Of course, he was resigning from a program that supposedly didn’t exist anymore (at least officially). Nevertheless, Elizondo made it clear that he was still very much investigating extraterrestrial phenomena. In his letter, the outgoing director lamented the fact that so much vital evidence was being swept under the rug. Among the incidents that Elizondo was referring to include an encounter between U.S. Navy pilots and an oval-shaped UFO that was captured by cameras aboard one of two F/A-18F fighters. The episode occurred in 2004 as Commander David Fravor and Lt. Commander Jim Slaight were both flying a routine training exercise in the Pacific about 100 miles off the coast of San Diego. The unidentified flying object appeared to hover 50 feet above the sea, but it soon darted closer to meet the jets. Commander Fravor later said of the UFO that “it accelerated like nothing I’ve ever seen,” explaining that he was “pretty weirded out” by the incident. You can see the declassified Navy video for yourself, which contains the real-time reactions of the two pilots. Does the government know more? 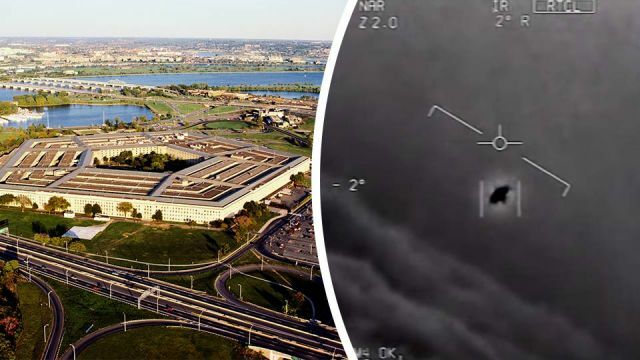 The video appears to offer highly plausible evidence of a genuine UFO and you could hardly ask for more credible eyewitnesses than two U.S. Navy pilots. But if this is what the government is willing to release, it certainly makes you wonder what else they may be sitting on. According to Robert Bigelow, a billionaire entrepreneur who owns a company (Bigelow Aerospace), which was contracted by the Advanced Aerospace Threat Identification Program to investigate the extraterrestrial phenomenon, there’s no question that aliens exist and have visited the earth. In Bigelow’s telling, companies and subcontractors under his direction have been studying metal alloys from unidentified aerial phenomena, as well as the physiological effect these objects have on humans. You can check out what Bigelow has to say on the subject of ETs in this revealing 60 minutes interview (below). A growing chorus of government insiders, scientists and influential entrepreneurs are calling for less politicization and greater transparency when it comes to UFO research. Programs like the Advanced Aerospace Threat Identification Program (which was a pet project of former Senator Harry Reid and his colleagues Ted Stevens and Daniel Inouye) were super secretive for many reasons including the fact that the program’s boosters didn’t want to come across as flakes or conspiracy theorists. Today, many key insiders, scientists and entrepreneurs are launching their investigations from a different vantage point. For example, Luis Elizondo has joined UFO enthusiast Tom DeLonge and a number of prominent scientists to team up for a joint venture called To The Stars Academy. This private organization promises to democratize the investigation into intelligent alien life. Their attitude seems to be, the government won’t tell us, so let’s find out for ourselves. Hey Buddy!, I found this information for you: "The UFO Program The Government Doesn’t Want You To Know About". Here is the website link: https://www.thealternativedaily.com/theres-a-whole-fleet-of-them-evidence-from-inside-the-governments-secret-ufo-program/. Thank you.